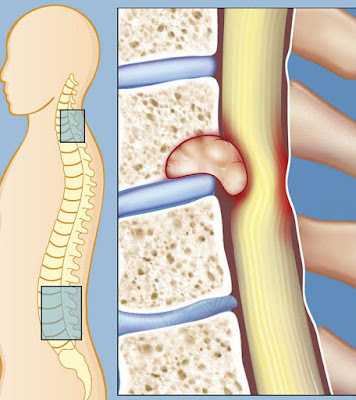 If you are suffering from back pain it is natural to wonder whether or not the pain might be a sign of spinal cancer.Spinal cancer in back may cause weakening the bone and back pain during movement of the back bone. Some general symptoms of spinal tumor. Feeling pain in the neck or back followed by neurological problems (such as weakness or numbness of the arms or legs or a change in normal bowel or bladder habits) is most common. Pain that may be worse at night than during the day. Loss of appetite, unplanned weight loss, nausea, vomiting, or fever, chills or shakes. If you are feeling back from very long time and have symptoms mention above consult with doctor and take action. Intramedullary Tumors , Intradural-Extramedullary Tumors, Vertebral Column Tumors.